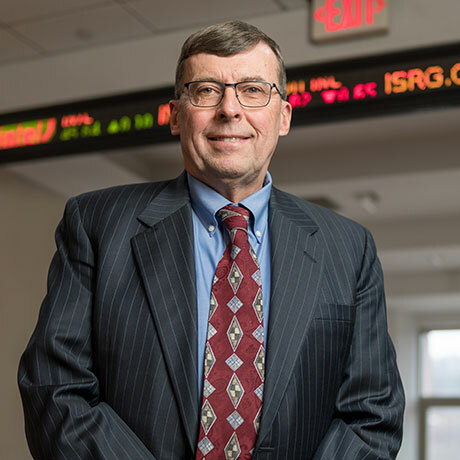 His current research interests include equity market valuation analysis, the impact of economic growth on asset pricing, as well as the economic impact of high-speed internet service to rural economies. Mr. Lewis holds the endowed Tredennick Chair in Entrepreneurial Studies at Alfred University. He was voted by students to receive the Joseph Kruson Excellence in Teaching Award in 2014 and 2016. He was named to the SUNY Alumni Honor Roll in 2000, and was inducted into the Alfred-Almond Humanitarian Hall of Fame in 2007. His twelve military medals include three for heroism. One of those is the Airman's Medal, the Air Force's highest decoration for saving a life when not in combat. He was awarded the Airman's Medal for saving the life of a civilian police officer who was assaulted and struggling for control of his service pistol with a mentally ill convicted felon the rookie officer attempted to arrest without first calling for backup. Motorcycle riding, canoeing, camping, fishing, hiking, forestry. I particularly enjoy hiking in the US and Canadian Rockies. At Alfred University, I enjoy helping students learn. I advise both the Student Managed Investment Fund and the Financial Management Association. Mr. Lewis is a former Air Force colonel and Senior Vice President of the New York Stock Exchange. He brings to the classroom his diverse set of skills and international experience as a senior leader in both the public and private sector. In addition to his senior management experience, he is a former Assistant Professor at Syracuse University and adjunct instructor of computer science at Troy State University. He has served as an adviser to Carnegie Mellon University, SUNY Institute of Technology, City College of New York and Hewlett Packard Corporation. He has served on multiple corporate investment committees with assets under management of up to $500 million dollars, and serves as chief investment officer for non-profit corporations with millions of dollars in assets under management. He is a member of the Financial Planning Association. He is currently Dean of the College of Business.